We use in coupling with windmill and generator. I went well. This review is about item#37531557. Parts that are perfect for functional aspects and materials. However, is there anything we can do for minor scratches on the surface? I already use it, but it is functional enough. For price, it is good if it is cheaper a little, but I am satisfied with the use. This review is about item#37531426. Production accuracy is good. 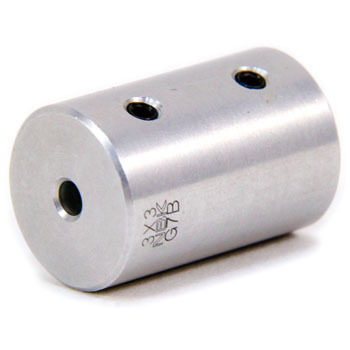 Because it is used for the rotary shaft, it is desirable for the application to be a little more tight. This review is about item#37531523. The hole to insert the 3 mm motor shaft was a bit irritable but I managed to get through. Since the person of 6 mm was a stringer bolt, it originally entered a small diameter without any problem. I would appreciate it if you have dimensional tolerances in the inner diameter of the specification column. In the 6 mm hole, the tapping screw was cut in two places, I thought that the detail was taken into consideration. Although I have not actually used it yet, it is good with feeling of operation confirmation. This review is about item#37531444. This review is about item#37531435. The shaft of the stepping motor was φ 5 mm, and the target shaft to be driven was φ 3 mm, which caused trouble in connecting. There are such parts. Moreover, it is attached to the shaft fixed anion screw. We satisfy our request 100%. it is perfect. By fitting the sleeve on the inch dimension axis it will be exactly 8 mm, so this different diameter joint could be used. Despite the necessity of depth, the general dial knob can not be used because the variable resistor is special. Since the dial for the inch shaft is custom-made, it was within the range that can be convinced when considering the overall cost.